Club Votes to Name New Center - Rivard-Simmons Rotary Event Center! Big news was the order of business at this week's Rotary Club of Brandon's luncheon. Through a combined donation of $100,000 from the Simmons Foundation and the Rivard Family, the club approved naming rights for the club's big project as the Rivard-Simmons Rotary Event Center. Through the hard work and focus of Roger Rivard and his family and the major contribution from George Simmons' Family Foundation, this project will now be a legacy for our club for many years to come. The club welcomed guest speakers – Dan Pepper & Bob Farkas – Active members of the Rotary Club of Tampa who spoke about the Military Transition Assistance Program which was started to provide assistance to Military personnel who are leaving the military and transitioning into civilian life. Their goal is to provide information, tools, and training to ensure Service members and their spouses a successful adjustment in civilian life whether pursuing additional education, finding a job in the public or private sector, or starting their own business. 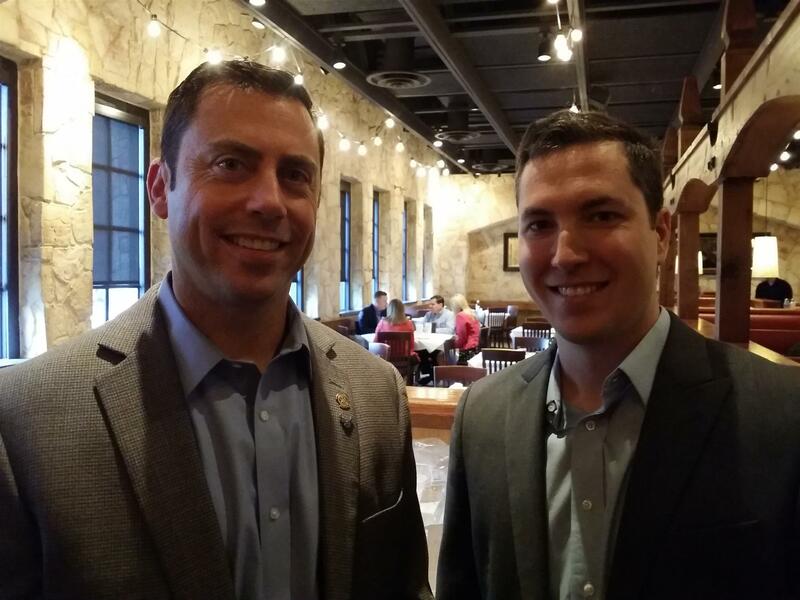 Bob and Dan are reaching out to Rotary Groups and other organizations who have members that own business and encouraging them to hire a veteran because of their experience, work ethic, leadership skills and values. Veterans bring valuable skills and experience from their military service including disciplined teamwork and upper level management skills. Their Linkedin Group for prespective employers is: tiny.cc/rotary. The club had some great guests as well, one coming all the way from the Norman Sooner Rotary Club. Fred Benenati from Oklahoma was visiting his twin brother John and came to exchange club banners. 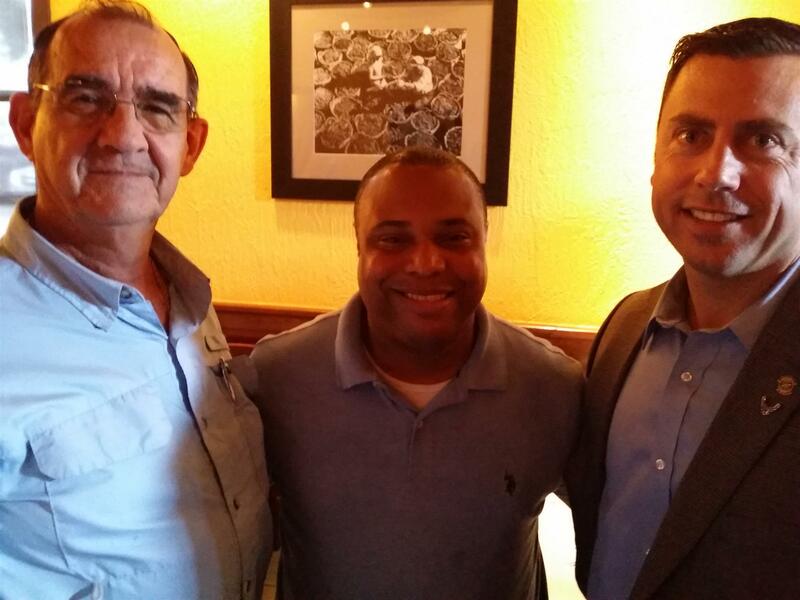 The club also welcomed Jondexter Tooms to the meeting as well. There was a ton to be happy about this week as well. 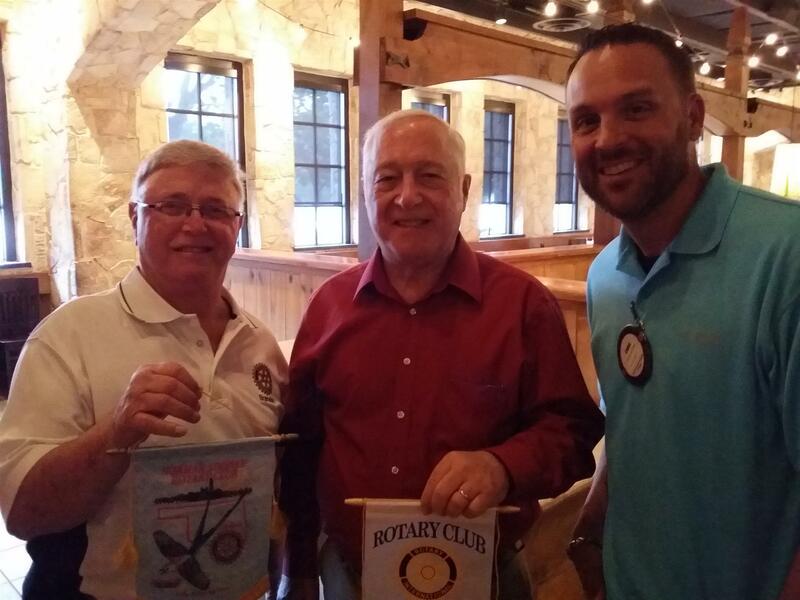 Bob Solano was happy to report he just returned from Puerto Vararta, Mexico and presented our club with a Rotary Club Friendship Flag from that club. He stated they give out over 45 scholarships to children in need. They also support and run a remote school for 25 children with disabilities. He let us know that 1/3 of the club is made up of Canadians and Americans who have retired to Mexico because the dollar is so strong. Alan Feldman was happy to report that he has been invited to teach at a Masters Photography Class in Johannesburg South Africa. That should be a ton of fun! Jeff Reynolds had a happy dollar for his son who is pledging a Fraternity. Look out, Jeff! A big Happy Birthday went out to Michael Hayes who celebrated his birthday on the 10th. The club gave him a huge rendition of Happy Birthday led by our lead vocalist, Jeff Reynolds! We had some big updates: Roger Rivard gave us an update on the and let us know that things are right on schedule. We are getting ready to purchase furniture, and Roger presented to the club a reproduction of a Thomas Kincade painting of Rotarians at a Rotary Club Meeting. With Club approval he hopes to hang it in the President’s Room. Joe Campoamor let us all know how the Wild Game Dinner was coming along. Only 28 VIP tickets remain, and we need to sell, sell, sell tickets in order to make this year’s event a success. Ryan Burley let everyone know that our quarterly club service Project will be February 18th at the Rivard-Simmons Rotary Event Center. • 3rd – WILD GAME DINNER! !